Thank you for sharing this. Could you also share us English version for rather than Chinese colleagues benefit when you are free? Thanks a lot! 這幾天發現你寫的臺灣日曆 for sidebar. 寫得真好,有辦法增加 scheduler 的功能嗎? 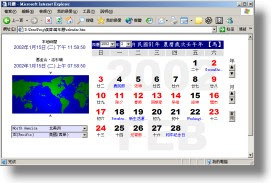 可任意設定日期,時間.時間到就會出現 reminder message box 那種. 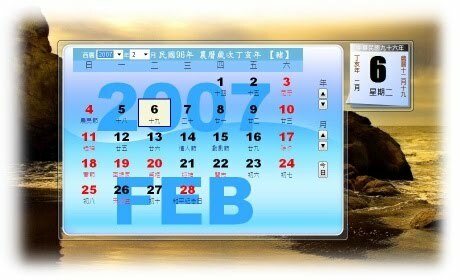 我在Vista上用台灣日曆for sidebar已經二年了,真的很實用.但這幾天發現在Windows 7 64位元上不能正常使用,點擊日曆的時候展開是空白的.不知是否可以請林先生針對Windows 7 64位元提供新版本,我個人還蠻喜歡這個小工具的. Then 2 days ago I noticed while my clock pointed to 12:17 around noon time, the 'Local Time' display was "00:17 上午". Maybe there is a better way to handle this? 方便小弟於 Excel 使用, 並發表(非商業用), 不知同意否? 我們計劃使用閣下所篇寫的萬年曆程式, 供給我們瀏覽者免費使用, 並想整合到該網站. 但因網站是商業用途, 未知閣下可否進一步提供使用要求或許可使用通知!